My wife and I recently spent a weekend with old friends at the famous Auberge du Père Bise in Talloires, on the beautiful Lac d'Annecy, which is near Geneva. The hotel, situated on a spit of land adjacent to the tiny port of Talloires, has views of the lake and surrounding Alps on all sides. Talloires and neighboring Annecy (and Annecy-le-Vieux) also are home to a number of wonderful restaurants, and we did our best to sample them. The best of them is Marc Veyrat, which gets three stars from Michelin and the only 20/20 in France from Gault-Millau, is closed for the season due to the illness of its celebrated chef-owner. However, to say we ate well would be a serious understatement. Specifically, we dined in "downtown" Annecy at La Ciboulette (one Michelin star), whose 44-euro menu is one of the best buys in France. Simply excellent food prepared with wonderful ingredients, including a cheese platter specializing in local cheeses (the local tome crayeuse is a revelation). 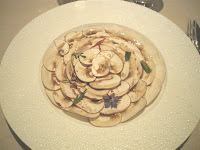 Next was Clos des Sens, in Annecy-le-Vieux (two Michelin stars), where interesting molecular and other modern techniques are practiced. 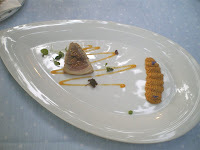 We found the decor to be a not very successful fusion of French and Japanese elements, and the food (and its presentation) to vary from excellent to over the top. 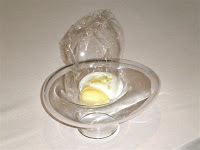 See the pictures below of mushroom appetizer, tuna plat, foie gras and lime sorbet in a sugar bag. 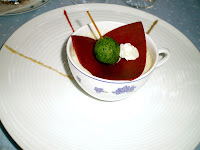 Another one-star restaurant that we tried was Le Belvédère, on a hill in Annecy with a lovely lake and mountain view. 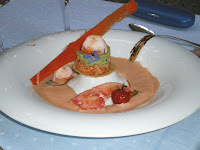 Here the food was a little less cerebral than at Clos des Sens, but still very imaginative and really delicious. 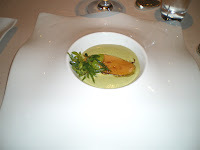 See pictures below of asparagus and tomato appetizers. Our last meal was at Père Bise itself, which is run by Sophie Bise, who has not changed since we ate there 30 years ago. She knows how to run a hotel and restaurant, to be sure, but we found the restaurant to be a little out of date and a mere shadow of the legendary three-star palace of the seventies (perhaps belied by the frogs' legs and lobster dishes pictured below). Still, if the weather is good (and ours was perfect), an elegant dinner with good friends on Père Bise's terrace is a memorable experience.